The 1950s aren’t always thought of as one of the most colorful eras of American history, especially when you compare them to decades like the roaring '20s, the psychedelic ‘60s, or the day-glo neon ‘80s. But even though a lot of the day’s entertainment was black and white, there are still plenty of flashes of rosy color to be found in the Eisenhower era. What’s more ‘50s than a pink Cadillac, for instance? Or how about the pink flamingos that started popping up in the lawns of newly built suburbs? And every teenage fashion plate kept at least one pink poodle skirt in her wardrobe. And then you have these snazzy specs, representing the classic cat eye style in bright, bold pink. 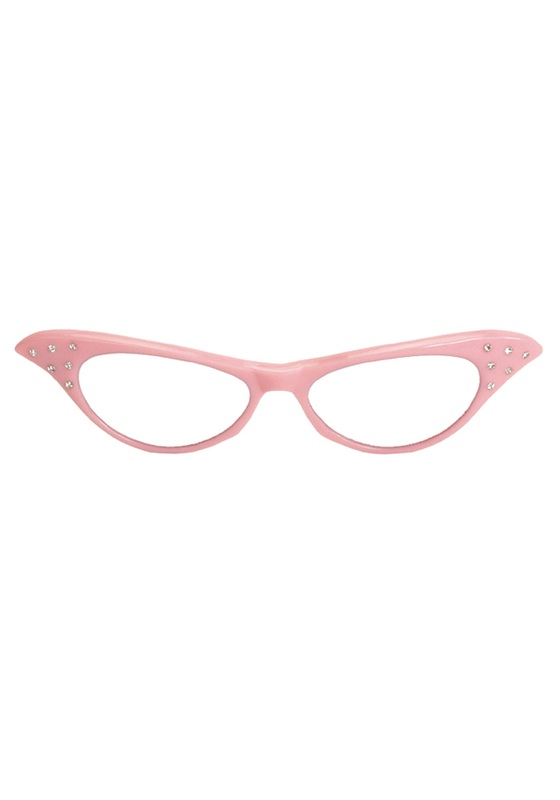 With pointy, plastic rims and glitzy rhinestone details, they’re just the sort of eye wear you might spot on a sassy car hop, at a swingin’ sock hop, or out for a cruise up Blueberry Hill. They’re a blast from the past and a splash of colorful attitude no matter what era you happen to be living in. This was great and tied my entire Grease outfit in together. I'm sorry to hear that! Hopefully you were able to get through the returns process just fine, let us know if you have any other questions. great accesory for the costume. Great accessory! Do not forget them!! !